Donald Trump’s embrace of neo-Nazis, white supremacists and other hate groups has alienated yet another of his showpiece “advisory” councils. 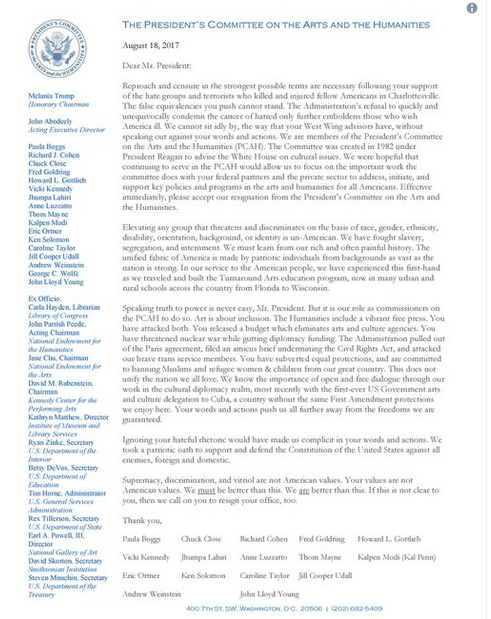 All 17 members of the President’s Council on the Arts & Humanities [PCAH] resigned on August 18, 2017, leaving a harshly worded break-up note. Their letter of resignation is the latest in an accumulating file of written protests by knowledge experts, industry luminaries and military leaders, whose moral compasses are guiding them away from a president whose policies and actions they feel they can no longer implicitly endorse. Reproach and censure in the strongest possible terms are necessary following your support of the hate groups and terrorists who killed and injured fellow Americans in Charlottesville. The false equivalencies you push cannot stand. The Administration’s refusal to quickly and unequivocally condemn the cancer of hatred only further emboldens those who wish America ill. We cannot sit idly by, the way that your West Wing advisors have, without speaking out against your words and actions. We are members of the President’s Committee on the Arts and the Humanities (PCAH). The Committee was created in 1982under President Reagan to advise the White House on cultural issues. We were hopeful that continuing to serve in the PCAH would allow us to focus on the important work the committee does with your federal partners and the private sector to address, initiate, and support key policies and programs in the arts and humanities for all Americans. Effective immediately, please accept our resignation from the President’s Committee on the Arts and the Humanities. Elevating any group that threatens and discriminates on the basis of race, gender, ethnicity, disability, orientation, background, or identity is un-American. We have fought slavery, segregation, and internment. We must learn from our rich and often painful history. The unified fabric of America is made by patriotic individuals from backgrounds as vast as the nation is strong. In our service to the American people, we have experienced this first-hand as we traveled and built the Turnaround Arts education program, now in many urban and rural schools across the country from Florida to Wisconsin. Speaking truth to power is never easy, Mr. President. But it is our role as commissioners on the PCAH to do so. Art is about inclusion. The Humanities include a vibrant free press. You have attacked both. You released a budget which eliminates arts and culture agencies. You have threatened nuclear war while gutting diplomacy funding. The Administration pulled out of the Paris agreement, filed an amicus brief undermining the Civil Rights Act, and attacked our brave trans service members. You have subverted equal protections, and are committed to banning Muslims and refugee women & children from our great country. This does not unify the nation we all love. We know the importance of open and free dialogue through our work in the cultural diplomacy realm, most recently with the first-ever US Government arts and culture delegation to Cuba, a country without the same First Amendment protections we enjoy here. Your words and actions push us all further away from the freedoms we are guaranteed.